Since 2005, the Gordon Hospice House has been providing care and comfort for families at end-of-life. And ever since the doors of the hospice house opened, Hospice & Palliative Care of Iredell County (HPCIC) has been committed to the promise that lack of insurance is never a barrier to care. 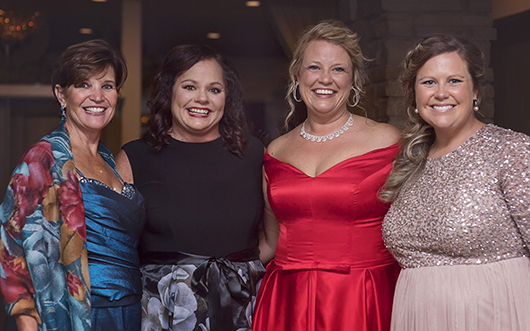 On September 22, the community once again generously showed its support of that promise by raising nearly $110,000 for the 2018 Moonlight & Magnolias Gordon Hospice House Gala. The bi-annual event, which drew more than 250 guests, was held at Statesville Country Club and featured Southern-inspired cuisine, live music, a silent auction and more. Co-chairs for the 2018 gala were Thom and Margaret Kincaid and Brian and Katie Long. Presenting sponsors were Country Boy Landscaping; Fast Phils; L. Gordon Iron & Metal; Randy Marion Automotive and Shaver Wood Products. Visionary sponsors were R.L. West and R. Gregory Jewelers. Platinum sponsors were Banner Drug; Davis Regional Medical Center; First National Bank; Iredell Health System; Kewaunee Scientific; Merrill Lynch; and Terri Phillips. Sterling sponsors: American Stainless Tubing; BB&T; Piedmont Healthcare; Wells Fargo; Locke-Lane Construction; Bio-Landscaping; Mr. and Mrs. Cory Cline; Mr. and Mrs. Thom Kincaid; Mr. and Mrs. Brian Long; Mr. and Mrs. Grant Miller; Brian and Patrick Griffith-Paige; Dr. and Mrs. Michael Schlesinger and Mr. and Mrs. Brian Sohovich. Friends of Hospice: Alarm South; Blueharbor Bank; Norris, Stewart & Ralston; Bunch-Johnson Funeral Home; Mr. and Mrs. Ralph Brown; Dr. and Mrs. Jerry Hill; Will Monroe; and Johnson Greenhouses. Florals for the event were provided by the Griffith family, Johnson Greenhouses, Four Seasons Florist and Brookdale Florist. A beautiful custom cake was donated by Sweet Thing Bakery.